The New York Red Bulls have loaned forward Carlos Rivas to Atletico Nacional in Colombia, the club announced today. 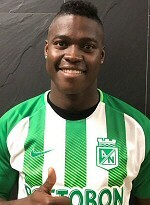 Rivas, 24, goes on loan in his native Colombia for the remainder of the 2018 season. "We believe sending Carlos out on loan is the best option for the player and the club," said Red Bulls Sporting Director Denis Hamlett. "The most important thing for Carlos and his continued development is to play consistently and we are glad to have found a good situation for him and his family." Rivas started three of the five MLS matches that he appeared in for the Red Bulls. The Colombian forward tallied two goals in 264 minutes played. Rivas also appeared in four CONCACAF Champions League matches and started and played 90 minutes in the U.S. Open Cup Round of 16 loss against Philadelphia.